The tour manager on a Stanford Alumni Association river boat cruise on a tributary of the Amazon River in Peru had been a school teacher in Palo Alto, CA. While visiting a small village, she learned from the teacher that the school was lacking proper textbooks for all grades in the school. 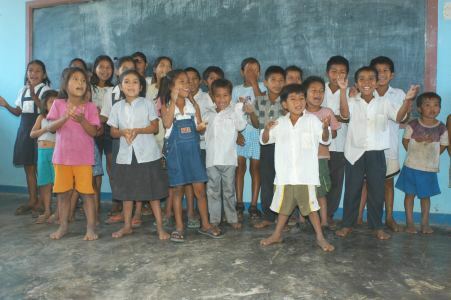 Donations from many travelers on that cruise provided the funds to purchase authorized textbooks and on a later trip they were delivered to the village. The children offered a joyous song of appreciation for the gift. See pictures of supplies being delivered on 2004 trip.